Just when you thought Ted 2 had no more jokes to share before it hits theaters next weekend, along comes a new international trailer that drops a few more laughs along with the poignant message that 'life means something!' Given twenty minutes behind the wheel, this living teddy bear makes sure to take his best friend John Bennett Mark Wahlberg on one crazy ride. In Ted 2, Ted decides to settle down with his new bride Tami-Lynn. But the couple hit a snag when they attempt to become parents. First, Ted is unable to reproduce, which leads him and John on a couple of crazy adventures in seeking a sperm donor. That leads to bigger problems, as Ted's existence as a citizen of the United States comes into question. Is he property or a person? And can he legally raise a child? Seth MacFarlane returns as writer, director and voice star of Ted 2, Universal and Media Rights Capital's follow-up to the highest-grossing original R-rated comedy of all time. Joined once again by star Mark Wahlberg and fellow Ted writers Alec Sulkin & Wellesley Wild, MacFarlane produces the live action/CG animated comedy alongside Bluegrass Films' Scott Stuber, as well as John Jacobs and Jason Clark. Take a look at this latest sneak peek, and then be sure to secure your tickets for next week. 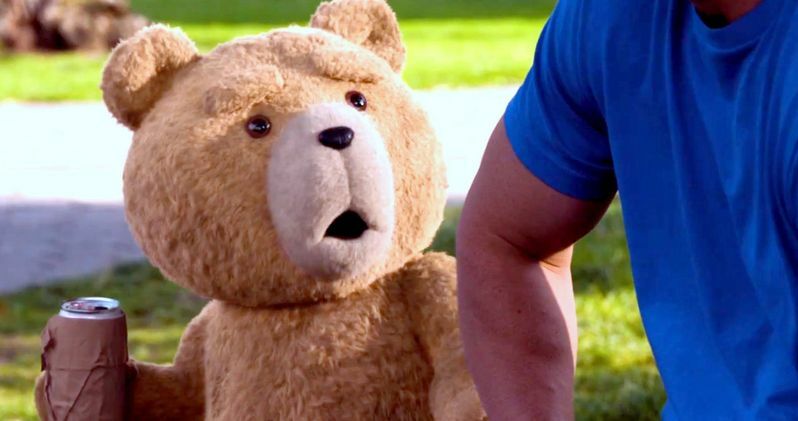 Is there any chance Ted 2 can beat Jurassic World's box office record?